The use of facade access systems and mobile elevated work platforms to clean and maintain complex building facades can often be costly and sometimes even impossible. SKYLOTEC now offers an alternative that makes working on such facade structures much easier: by combining the “Skyrail” rail system with the battery-operated “ACX” power ascender. 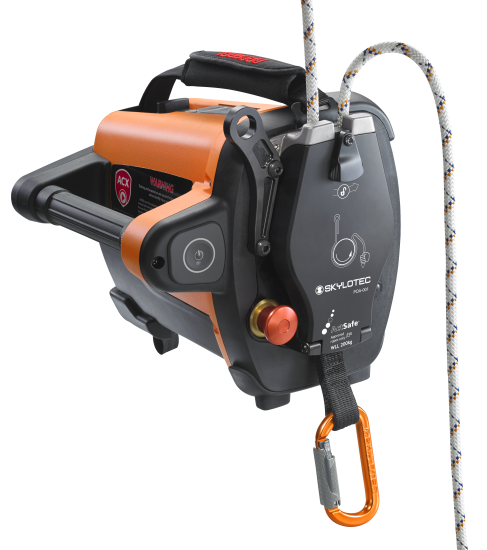 This work device replaces access systems or mobile work platforms for building cleaners. “ACX” makes the place of work easier to reach and users can then carry out their work along the facade more efficiently and more flexibly. Workers mainly use facade access systems to clean building facades. This equipment is expensive to purchase and maintain. In many cases, it is often also unsuitable for buildings. This may be the case, for example, if façade structures are too complex or work has to be carried out in exposed locations. Using mobile elevated work platforms is also cost-intensive and often not even possible, because there is not enough floor space available for it. That’s why it’s important to take into consideration, right from the planning stage of a building, how and by whom the façades will be cleaned. SKYLOTEC is now introducing a brand new solution: the combination of the battery-operated "ACX” personal ascender and the “Skyrail” rail system. Using the “ACX” means there is no need for building cleaners and maintenance technicians to work with facade access systems or mobile elevated work platforms. Instead, the horizontal “Skyrail” rail system from SKYLOTEC is mounted to the facia or facade. Radius-turn modules and spacers make it possible to adapt the system to the course of the façade over longer stretches and mount it. The rail elements are also available in different colours. The securing system can be inconspicuously integrated in the building structure and adapted to its colour scheme. 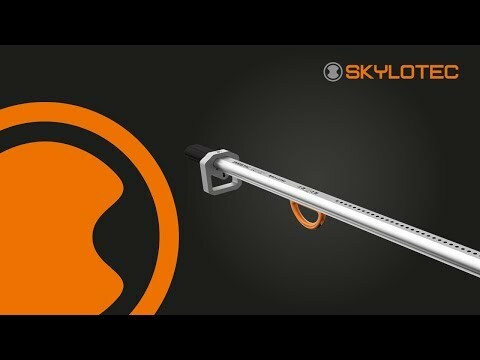 The user attaches the “ACX” ascender to the “Skyrail” using a rope and a carabiner on the easy-slide “Skyrail Runner”. A second rope is used as part of the personal fall protection equipment (PFPE) with a guided type fall arrester in accordance with EN 353-2. 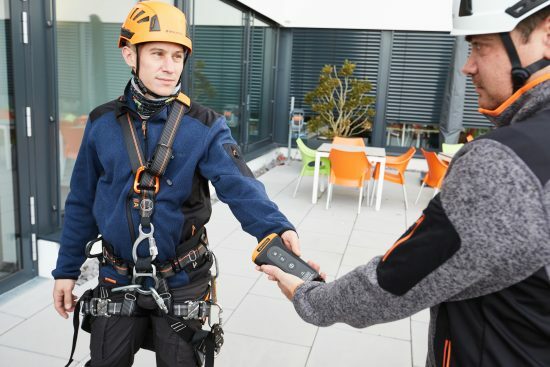 Thus reliably secured, building cleaners or maintenance technicians can move along the façade from top to bottom or from left to right without using their own muscle power, whilst wearing an appropriate sit harness. Building cleaners can use a lever on the “ACX” to regulate the speed of raising and lowering as required - from 0 to 24 metres per minute. This makes it easier for building cleaners to complete their work more easily, more efficiently and more flexibly than with a lift. Moreover, the equipment can also be used to move across interior façades, such as in buildings with high window fronts. An additional benefit is that it is easy to learn how to use the system with a training session. 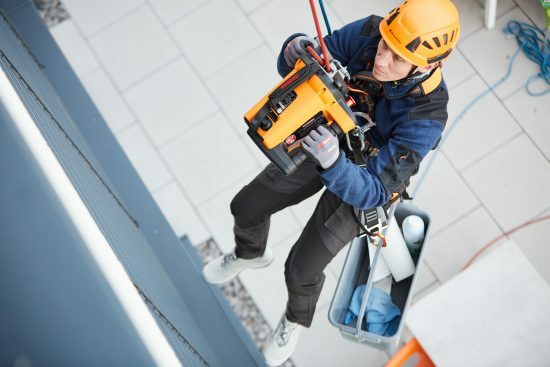 This method of working is referred to as ‘rope works’ in accordance with ISO 22846-1 and does not require extensive training as a rope access technician. In terms of occupational safety, the “ACX” offers additional benefits. For example, the equipment has built-in safety electronics, which constantly monitor and regulate the charge status, temperature and energy output of the batteries. In the event of overheating or overcharging, the system temporarily shuts down the battery to prevent damage, which would make it dangerous for the equipment to be used. In addition, the device can be controlled using a remote control from the ground, up to a range of 150 metres. In this way, a person on the ground can move a colleague up and down the façade. This may be necessary if the person concerned is no longer capable of doing this, for example in the event of a medical problem, such as an unforeseeable dizzy spell. The “ACX” is suitable for lifting persons and loads with a safe working load (SWL) of 200 kilogrammes. In addition, it has the IP protection class 55, which means the equipment is protected on the inside from dust deposits and spray water from all directions. More information can be found here.